I was in Maui last week. Look, someone had to go and I had my hand up first. Anyway, long story and I just completed the manuscript for my book and off to the publishers. I had to regenerate grey cells. And when one blogs, you obtain your inspiration from, well, anything. Basically your surroundings, dinner conversations, even going up and down grocery store aisles. (We won’t discuss the type of inspiration one obtains when driving in heavy traffic). I snorkel and swim. Good thing to like to do when in Maui, let alone anywhere. I had the opportunity of snorkeling with the Pacific Whale Foundation eco-tour for smaller groups (which I highly recommend). We went to Molokini Crater, which is one of the best places in Hawaii (let alone anywhere) to go and offers incredibly diverse underwater ecology. On the way to La Perouse Bay, we encountered about 200 spinner dolphins. Which is unusual. First of all, these wonderful creatures are nocturnal. So seeing a large and energetic group during the day was unexpected. And yes, they spin. They leap out of the water and can rotate as many as 6-8 times before hitting the surface again. Quite a show put on by the adolescents and teenaged spinner dolphins, who were not content to remain with the rest of the group. Show-offs! What was really unusual, as our on-board ecologists told us, was that about 5 distinct groups of the spinners had come together and were now traveling as one. These amazing creatures realized that occasional collaboration was a great evolutionary strategy. 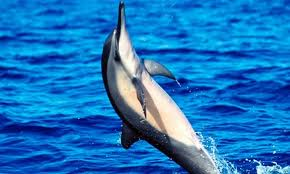 By forming larger groups, the spinner dolphins created a degree of protection from outside predators, like sharks and whales. There were more eyes and echo location to signal danger. Larger groups also offered the opportunity for hybridization of the gene pool. 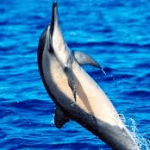 In other words, by breeding with individuals outside of their normal group, the dolphins potentially were introducing new genes into the group which might infer greater resistance and resilience to parasites, barnacles and remoras as well as the microscopic poachers found within these parasites and symbiots. And there was something else going on. There was at least one other species of dolphin, the spotted dolphin, observed traveling with this large group of spinner dolphins. What was up with that? Inter-species collaboration for starters. Collaboration of a far greater kind, most certainly. Which got me to thinking about how this rather large group of spinner dolphins had arrived at the concept of collaboration for survival, perhaps in response to changing ecological conditions. I doubt that they reached consensus or hashed it out at Monday morning meetings (you, know, a dolphin version of “OK, who wants to stick out their neck first? I’m into my job security.”). I wonder who the first dolphin was who made the overture to the second group of spinners to come together. Frankly, I think a whole bunch of groups spontaneously arrived at the same conclusion. Just because it felt, biologically and ecologically, like the right thing to do. I think it just happened because it had to happen. Talk about sink or swim. So how many groups of individuals do you have swimming around your company who might benefit from coming together to collaborate for competitive advantage? There is something to be said, after all, for the value of bringing together diverse perspectives for the benefit of hybridized product development which might allow your company to develop new markets and audiences. And you can’t obtain this perspective if everyone has a siloed mindset and a my-department vs. your-department competitive attitude. You know, that technical professionals vs. non-technical professionals thing. Then there is the competitive advantage created by collaboration with those companies and individuals whom you consider to be your competitors. Sort of like that spotted dolphin. Talk about broader competitive advantage. Are you one of those individuals who would like to leap out of the water and spin around a few times to shake things up a bit? What is holding you back? Are there departments in your organization with whom you could collaborate, to positively influence competitive outcomes? Perhaps you can see them swimming just beyond the horizon of the walls of your cubicle. I bet they look just like you, not too intimidating. Are they looking back at you when you take a peek over that wall to get a glimpse of them jumping out of the waters in which they are swimming? So what are you waiting for? Don’t even start to second-guess yourself about the drawbacks of collaborating. I don’t think the spinner dolphins gave it a another thought. And they looked like they were not only surviving, but thriving. Babette N. Ten Haken, Founder & President of Sales Aerobics for Engineers®, LLC, brings entrepreneurial mojo and business- and revenue-producing collaboration and communication tools to small and mid-sized businesses and startups. She was named one of the Top 50 Sales & Marketing Influencers 2013-2016. Her book, Do YOU Mean Business? focuses on technical / non-technical collaboration strategies and tools. So glad you enjoyed this post. I draw my inspiration for topics from my surroundings and from individuals. Appreciate your including the additional quotes. Best wishes.